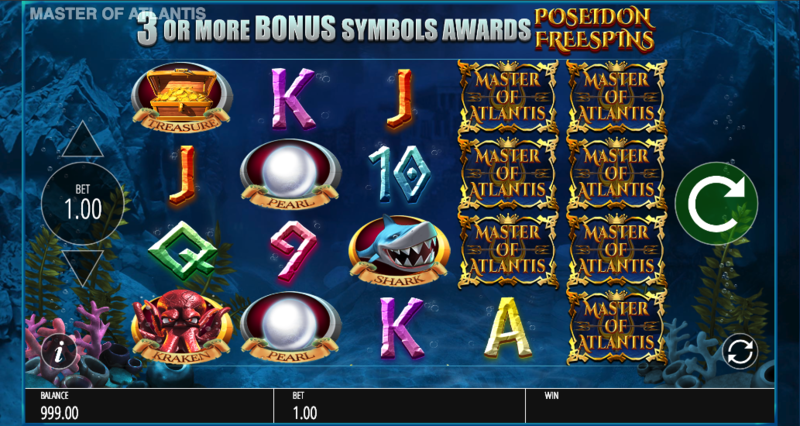 Greek mythology is the theme of this online slot from Blueprint Gaming which offers players enhanced free spins and the random Trident Strike bonus; it’s called Master Of Atlantis and it features Poseidon, the God of the Sea, who stands ready to help you out. 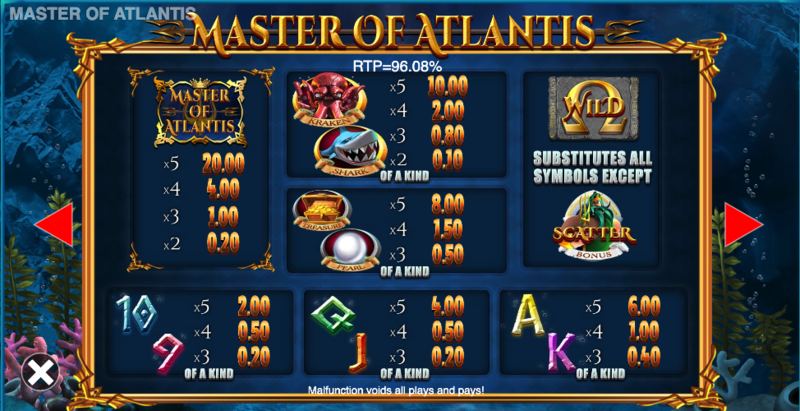 Master of Atlantis is a five reel slot with four rows and forty fixed paylines; it’s all set underwater of course where the sunken city is just about visible in the murky distance behind the rocks and flora. The higher value symbols include the Master of Atlantis logo, the Kraken, the shark, a treasure chest and a pearl; 9, 10, J, Q, K and A represent the lower values. The wild symbol is the Greek letter Omega and it will replace all others to help form winning combinations except for the Poseidon scatter symbol. This is a randomly occurring event which can happen at any time and you will notice the screen darken as Poseidon unleashes the power of his trident! What this means is that mystery symbols will be added to the reels which will transform into matching ones, hopefully resulting in a win. This is triggered by landing at least three of the Poseidon bonus symbols anywhere in view; you’ll now get one Power Spin (but two or three if the round was triggered with four or five Poseidons). A Power Spin sets the value of the scatter wins for the rest of the round. You’ll now receive five free spins in which up to five scatter symbol can land on each one, paying out the prize determined earlier. Landing Poseidon on reel three during this round may award extra free spins or Power Spins. You can’t go too far wrong with a slot themed on the Greek god of the sea and the legendary subterranean island of Atlantis; the Power Spins add a bit of extra underwater zip, as do the slightly odd sound effects.